The growth experiences of a suburban mother/psychologist/wife in search for excellence. Her explorations of the numerous therapies have led her towards amazing adventures. She found Babaji's prescription of truth, simplicity and love to be the main ingredients necessary for a happy, prosperous and fulfilling life. It is time to own our true nature and allow our knowing to create abundance of all goodness in our lives. 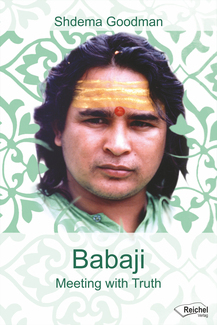 I learned from Babaji how to manifest desires that are for the highest good. This ability increases with practice. The biggest opportunity was after I had breast cancer twice (August 1992 and June 1993). In December 1994 a 4 cm breast tumor was discovered, swollen lymphnodes and pain in some bones. I felt that cancer was spread throughout my body and thought that I was dying. I knew that if I had a mastcemoy again more pieces of my body will need to be cut our until there will be no more Shdema to cut. I decided to put to test all I have learned and risk treating myself without any medical intervention, not even a biopsy. Within 3 months the tumor shrunk to 2 cm, and all symptoms were gone by November 1995. I regained radiant health and reyouthing - look many years younger! If I can do it I believe that so can anyone - I am a very simple person. Shdema Goodman-Moussaieff, Ed.D., a psychologist, visited with Babaji Mahavatar - first heard about him from 'Autobiography of a Yogi' - from 1978 to 1987. Dr. Goodman successfully reversed her 4 cm breast tumor using mental imagery, PNI (psychoneuroimmunology) and Babaji's teachings. Shdema has been treating and training therapists including physicians, royalty and the public in her methods for over 20 years.